Researchers in development sector produce a pool of training material and case studies. However, these do not trickle down to the society and many in the public domain are unaware of the same. Largely the research is restricted to non-profit organizations or their funding agencies during the project period. If the research carried out in development sector is re-licensed and then linked to Wikipedia articles as references we could see a larger section of the society gaining access to such information. The twin advantages of posting such content is that the information will be searchable online through search engines and the Wikipedia page with numerous hyperlinks leading to different sources will act as a reference resource. Larger sections in the public domain will have access to information which would perhaps be hard to gain access to. 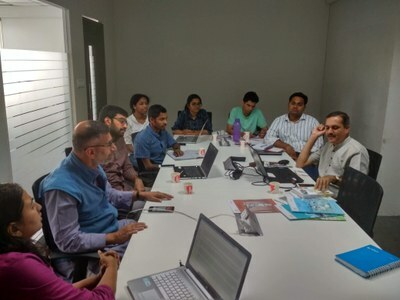 Pictured above: Meeting at Vikas Anvesh Foundation office to discuss the possibility of disseminating the research work done, through Wikipedia. Subodh Kulkarni was the resource person for the meeting. [Picture by Sdeora14 licensed under the Creative Commons Attribution-Share Alike 4.0 International license]. Keeping this in view an orientation session was conducted by Centre for Internet & Society’s Access to Knowledge wing (CIS-A2K) at Tata Trust’s Vikas Anvesh Foundation (VAF) in Pune. CIS-A2K and VAF joined hands to explore possibilities of content enrichment in Wikimedia projects. Dr. Ajit Kanitkar and Subodh Kulkarni were the facilitators for the session attended by eight participants. The researchers at VAF presented their publications in the form of study reports, papers in journals and conferences and datasets. Advisor Ajit Kanitkar presented story of 'Gems of Purest Ray Serene', a book about the life stories of twenty-two outstanding Indian social workers. The content of the book is uploaded on VAF's website socialworkindia.in which is freely downloadable. The book is published in Marathi and Hindi language also. After the presentations from VAF, CIS-A2K facilitator presented different Wikimedia projects.In the discussions, it was realised that Wikipedia articles related to social issues and development sector lack reliable references. The research work on VAF website can be linked as references. The publications could be uploaded on Wikisource for wider reach. The images and videos during the work can also be uploaded on Commons. VAF will discuss the process of content donation with management and decide on the further steps. The training regarding Wikipedia editing and Commons uploads would be planned.